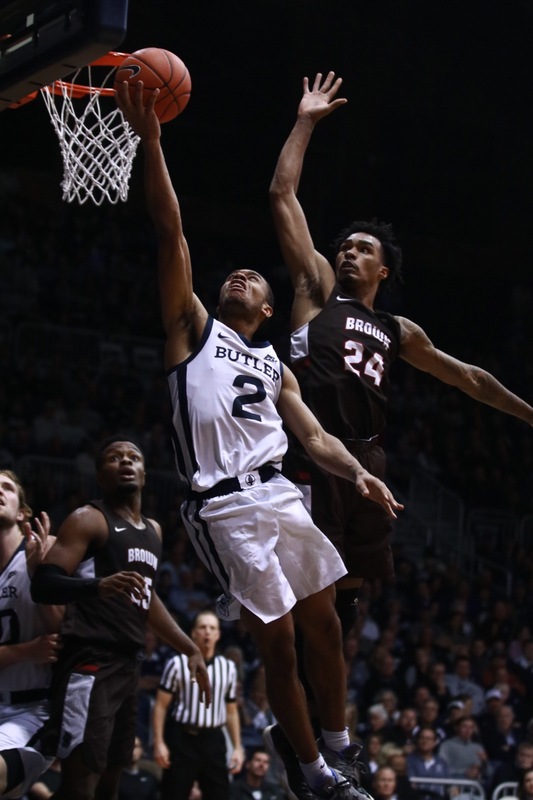 Aaron Thompson drives to the hoop in Butler’s 80-65 win over Brown. Photo by Jimmy Lafakis. After a disappointing loss to Saint Louis, the Butler Bulldogs returned to Hinkle Fieldhouse to try to get back on track. Brown, out of the Ivy League, posed as a good team for Butler to get some reps before Big East play. After nearly three weeks on the road (or overseas), historic Hinkle was a sight for sore eyes. And Butler Blue was back to his bones. But… the incoming opponent wasn’t the most exciting that the Bulldogs will face this year. What’s the most boring Butler game this season? Early it was Henry Baddley’s 10 points and 3-point shooting that was pacing Butler offensively. It was a good half of basketball considering their recent past. Butler hit nearly as many shots in the first half against Brown (16) as it did in the whole game against Saint Louis (18). And Butler got to dominating mid-major opponents as they should. Jorgensen scores in transition and it's 41-17. However, the Bulldogs seemed to fall asleep on Brown as the Bears starting mounting a comeback. After shooting 3 for 17 in Saint Louis, Baldwin’s offense was good to see for Butler fans. It was a long-gone conclusion that BU would come out victorious, so some called to see some players we have yet to see this year. No, it wasn’t the prettiest, but hey, a win’s a win. However, as better teams approach on the schedule, it’s obvious that something will need to improve. Something needs to change offensively or we are going to get embarrassed next weekend at Bankers Life. The Butler play this Saturday against the Northern Illinois Huskies at 4:30 to finish out the week homestand before playing in the Crossroads Classic.